A big slice of success. It’s 2010. 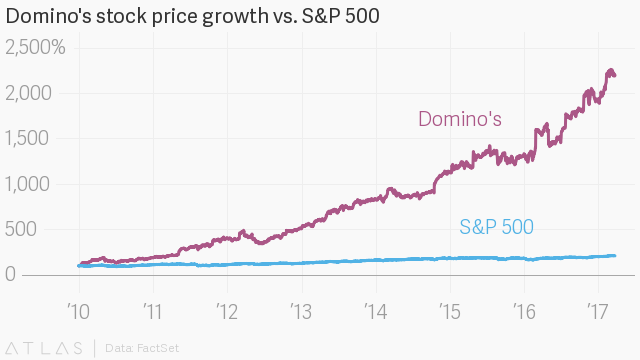 You’re an eager investor presented a choice between two stocks: Google or Domino’s Pizza. Where do you put your money? You should have gone with your gut. 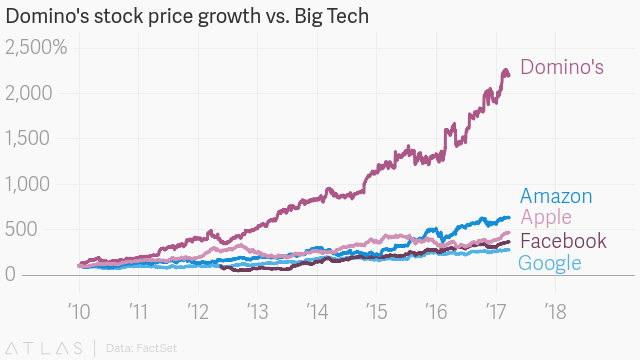 In an incredible feat for a pizza company, Domino’s share price growth has outperformed all of the world’s largest tech companies so far this decade. An investment in Domino’s at the start of 2010 has grown by more than 2,000% to date, leaving the likes of Amazon, Google, Facebook, and Apple in the dust. 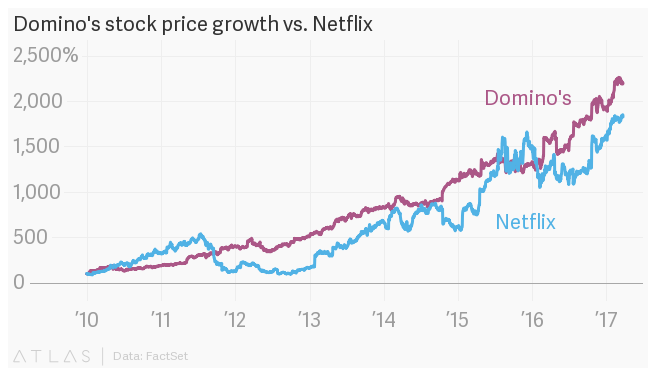 Actually, compared with every stock listed in 2010 on the NYSE or Nasdaq of a decent size—a current market cap of $1 billion or more, a universe of nearly 2,300 companies—Domino’s performance since 2010 beats all but three of them. (You can check out the top 50 at the end of this article.) The pizza chain is topped only by two medical companies (Accelerate Diagnostics and Acadia Pharmaceuticals) and Patrick Industries, a furniture and building materials group. Fast-forward seven years and Domino’s has a market cap of around $9 billion, propelled by its new pizza recipe and menu items such as chicken wings and salads. Correlation? We’ll leave that one to the financial analysts.